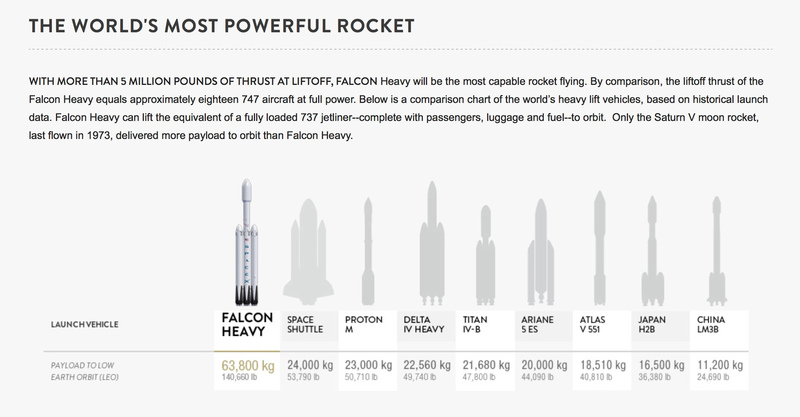 If all goes nominally (that’s rocket talk for “awesome”) then SpaceX‘s new giant rocket system, the Falcon Heavy, will make its first launch on Tuesday, Feb. 6 from Pad 39A at Kennedy Space Center at 3:45 p.m. ET* (12:45 p.m. PT / 20:45 UTC). This vehicle is basically three Falcon 9s strapped together and can deliver 64 tons of mass to Earth orbit and, at liftoff, will create 5 million pounds of thrust—equal to 18 747 jet airliners. As this is a test flight, the chosen payload mass will be CEO Elon Musk’s red Tesla Roadster, which, once released from the payload fairing, will be launched toward the orbit of Mars (but not TO Mars, contrary to what some articles have claimed.) Meanwhile the two Falcon 9 first stage boosters will return to on-ground landing zones and the main core stage will land on the deck of a drone ship in the Atlantic. Watch an animation of the test flight here. If this all orchestrates as planned—i.e., nominally—it will be the biggest achievement of SpaceX to date! Watch the event live above or at http://www.spacex.com/webcast. Don’t miss this!